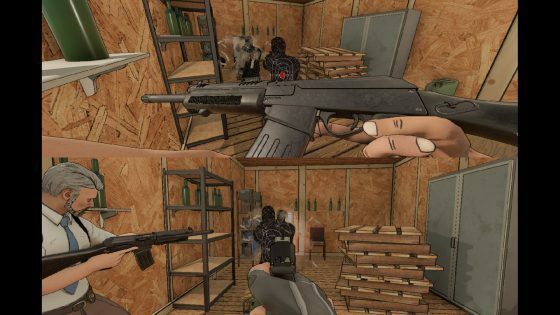 This comic book style first-person shooter feels like a breath of fresh air, arriving at a time when the genre leaders are only willing to imitate (cough, Battle Royale) rather than innovate. 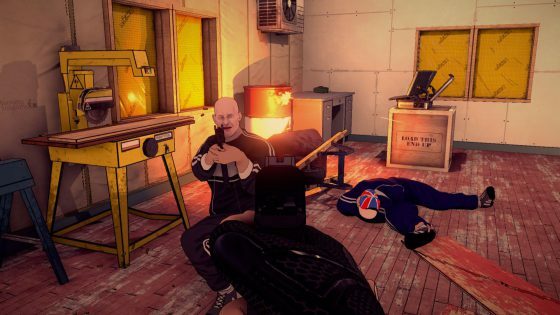 Bristol-based Ground Shatter (Binaries, Skyscrappers) has looked to the past to give shooter fans something new, with RICO being influenced by such fast-paced, quick-draw, arcade shooters as Time Crisis and Virtua Cop. Or to be more exact, it’s a thoroughly realised version of Time Crisis 4’s often forgotten FPS mode, which was no longer on-rails but still possessed arcade-like sensibilities. Perhaps not the most useful of comparisons, but rest assured we aren’t in typical shooter town. Here, you’re kicking down doors and shooting smartly dressed drug lords and tattoo-covered thugs in glorious slow-mo, clearing out one room at a time. Once the dust settles, it’s then a case of collecting evidence (briefcases full of miscellaneous contraband) and scavenging for crucial health/ammo pickups before finding another brittle door to boot. The developers have implemented ways to keep backtracking to a minimum while hunting for evidence. Not only is the map surprisingly helpful, showing rooms yet to be peppered with bullets (cleared), but items of importance are also highlighted. Thanks to procedural generation each level is different from the last, and there’s a decent variation in themes: posh mansions, apartment blocks, construction sites, offices, and more. It’s a mystery as to what lies behind a door – anything from a trio of enemies to a dozen, maybe an explosive barrel to thin the numbers if you’re lucky, or a ticking bomb if luck isn’t on your side. If that wasn’t enough to keep you on your toes, destroying servers and defusing bombs will often summon reinforcements too. The level randomisation isn’t faultless – we came across a few peculiarly narrow rooms and one corridor that lead to nowhere – but for the most part, it does a good job of providing varied layouts. Mission objectives are likewise doled out at random, complete with a few bonus targets such as performing a certain number of headshots. Generally, though, you’re tasked with either collecting evidence or clearing out every room, with later levels set over multiple floors. Get in, make a mess, and get out while there’s still time on the clock – cases must be cracked within 24 in-game hours. Completing objectives earns merit points, used to purchase new weapons, larger clips, laser sights, and both frag and flash grenades. Weapons are loud and punchy, becoming more exuberant as things progress. Only two firearms can be taken into battle, and as some have drawbacks – such as heavy recoil, slow rate of fire, or a small ammo capacity – it’s worth mulling over which to buy. Health carries over from one stage to the next, so occasionally merit points must also be spent on health top-ups. Single-use resuscitators, meanwhile, can bring you back from the jaws of death. In keeping with the ‘roguelike’ theme, campaign missions are spread across a flow chart that alters from one run to the next. 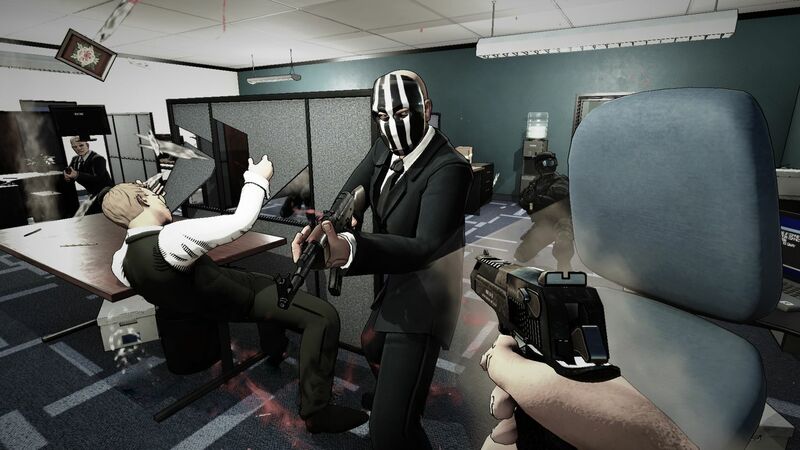 Between the first stage – a slightly dull training mission of sorts with pop-up targets – and the final confrontation with a notorious drug boss, ten missions lie. Usually, there are two or three of varying difficulty to pick from, and some may present a lieutenant to track down. Being an arcade-like experience, a successful run takes around half an hour. Chances of reaching the final stage can wildly vary – due to randomisation, it’s down to luck of the draw. Ticking timebombs ended a few of our runs. Finding two or three within the space of a few minutes is an easy enough task, but when it came to defusing four bombs we always failed to find the last one before the time limit was up. 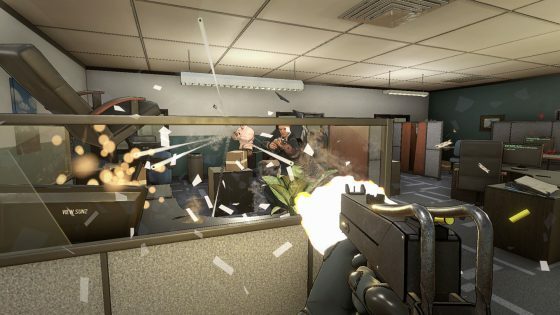 Playing in co-op mode (RICO supports both local split-screen and online play) helps elevate some of the more stressful moments, providing your teammate is willing to listen to orders. Partnering up to fight crime is easily the best way to experience RICO. Daily missions give incentive to return, serving as a quick-burst distraction from the main game. Additionally, there’s the wave-based Lockdown mode. Due to being set on a rooftop, door kicking action takes a backseat, while the slow-mo feature occurs seemingly at random. Limited cover and enemies that only drop health packs occasionally make reaching the tenth wave no easy task. With its procedurally generated levels, random mission objectives, non-linear structure and tight time limit there’s a lot going on behind the scenes. When the pressure starts to mount, a few cracks start to show. But like a typical ‘80s cop show star, RICO always manages to keep its cool.